Get it at Amazon.com for less than 20 bucks! I was blessed to find this little gem one day and it's helped my mountain biking tremendously. No matter how good you are, this book can help you improve and belongs in your arsenal. I've recommended to probably a dozen people now and everyone that's read it made some huge improvements with it. It's not often that I can say a book makes any real difference in how well I do an activity, however Mastering Mountain Bike Skills is one huge exception. 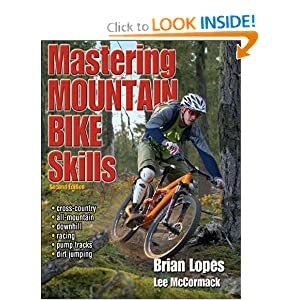 It's written by Lee McCormack with Brian Lopes, 3X World Champion. Everything in this book is articulated so clearly and with real world implementation at the end of the chapters. It's spelled out in such perfect annotation that you get out on the trail and just say "ah ha!, this is what they were talking about...", and your skills improve instantly, it's that easy! The Garmin Edge 500 can actually do turn-by-turn directions on a preloaded course if you do it the right way. In my quest to get this working just the way I wanted it to, I tried many different options. Options such as BikeRouteToaster, RideWithGPS, GPSies just to name a few. I also tried the GarminTraining Center, which is Garmin's built-in application for created courses. None did exactly what I wanted and they all left me a little frustrated at times. I wanted to write a step-by-step guide to walk others through what I found to work best for me. The social activity sites such as Strava, Endomondo and Runkeeper are great for activity tracking when a person doesn't have a GPS such as the Garmin Edge 500 and wants to simply use a smartphone instead. But if you have a Garmin Edge, take advantage of the better accuracy it provides, as well as the additional information such as temperature, altimeter adjustment and others. It's really easy to record your rides on the Edge and then upload them automatically to Endomondo. Here's how you do it.